Note, the included image is actually from the intro. There are already articles out there addressing peoples dislike for the ending to Far Cry 5. Much bigger names that us are tackling that hurdle. The irksome point I came across was shortly after the credits had rolled. It wasn’t just that I didn’t like the ending, after it took me a moment to take in. In fact, I was okay with the ending for about two minutes. Then it all settled in. Obviously, this article contains spoilers for the ending of Far Cry 5. What falls apart for me is that Far Cry 5 isn’t a two hour movie. 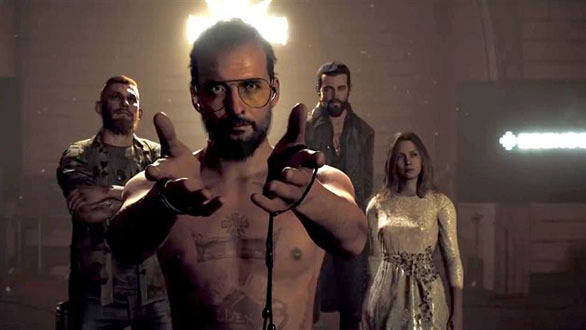 Things like film get to be edgy like Far Cry 5’s “bad” ending tries to be. First off, lets discuss the ending options. The one where you attack Joseph Seed sees the world or at least country being destroyed by nuclear annihilation. If that wasn’t bad enough, after a thrilling escape in a vehicle with your friends you wreck and Joseph is the last one you’re left with in a bunker. He’s even in control, having drug you down into the bunker himself after the crash. It’s fun, unexpected, and almost has a DC comics Joker flair to it.The trouble is to begin with, Joseph Seed has none of the character building of someone like the Joker. Instead, you really just want to bash his head in with a rock. And you don’t get to. So what? Well, Far Cry 5 isn’t a film. It’s not some small media that you ingest on a night out with your friends. It’s a huge adventure that you sink a ton of hours into and as such you want to be rewarded. We’ve had things like this in games before and I don’t care that Joseph won. I care that the game ended and left me with no option for retribution. That’s not the end of the story. I don’t go quietly into the night. I find a way to make Joseph pay for what he’s done. Get back here Ubisoft, that’s not the credits! Gah!! Really though. The worst part is the game is great! Sure, you’ll encounter the occasional death that will seem unfair and have to wait through another loading screen you don’t think you deserve. However overall it’s solid. If anything I’d say Far Cry 5 brings back the feeling that made me love Far Cry 2 so much. The three areas are fun, but I felt they became progressively out there in the direction I played them. John felt the best and I was even happy with the concept that the game could have ended with him being defeated. His region felt solid. In comparison though after completing one area, all the rest feel like you’re going through the motions. It’s a video game again, not really a revolution. That’s okay though. I still played through it all. Then there just wasn’t much of an ending. Joseph does have a battle that feels satisfying but you don’t kill him. He’s just handcuffed. Again, what is this, a DC story all of a sudden? Yes, that was the original intention at the start of the game. You’ve also taken out half the states population at this point including Josephs two brothers and daughter. So why in the world are we suddenly holding back? As a video game, you’re not being rewarded in Far Cry 5’s ending. While that can bring a smile to some gamers faces, it’s not typically how video games work. Some games do have a similar dark vibe to their end and it’s worked. Far Cry 5 doesn’t end. You’re either with Joseph or the other ending is that your attack trigger song comes on the radio while you’re leaving with the friends you arrived with. In that it’s presumed you kill them. So the only true ending is to never handcuff Joseph in the intro to the game. So literally, if you don’t play the game you at least get to keep your friends. Not playing the game is the answer? What kind of message is that to send out to your fans! Even then, yes, arresting Joseph Seed starts the collapse by beginning his vague prophecy. While cute that you can avoid that by not participating in his arrest, wouldn’t someone else come along? Wouldn’t that lead to the same ending? It’s such a beautiful game, Ubisoft, Y U no give me a way to win? Another thing I want to address too, which dips slightly into Assassins Creed Origins spoilers for the main story, so please, skip this paragraph if you like. Is that Ubisoft for two games now has garnered emotion from gamers by killing off a youth. One in story, one in gameplay. I’m not one to say, “Hey that doesn’t fit with the rules of writing, don’t do that!” but both stories feel empty for it. It irked me in Assassins Creed and in Far Cry 5 it was completely meaningless. Joseph Seed is a monster! I’ll… play scrabble with him for all eternity. That’ll show him. There’s no way to lash out. No way to say, “You did that? Well I’m the hero! Take this Joseph!” It’s just a thing, and as such it feels hollow. Like it’s just an attempt to make you hate Joseph if all the other stuff hadn’t really convinced you. The game even builds up that you’d be given a choice at the end, but it’s never the one you expect. The way I felt the brothers and daughter were explaining it was that you’d be given the option to fight back or join the cult after seeing the error of your ways. That’s not it. You can give up the friends you met in the valley to Joseph’s flock and attempt to leave, or you can fight back and lose. Eh… I wouldn’t have joined them anyway but what kind of choices are those? You see the characters you’ve fought so hard to save under Joseph’s control and you just turn your back on them? John also made the most solid story for me because he wasn’t using any outside force to influence people. He was legitimately a monster. Faith drugged her followers, and Jacob had his brainwashed. Yes, John forced his will on his people, but that didn’t go far outside the scope of reality. You can’t make someone see the bliss. You can’t create a drug cocktail that will for sure make people hallucinate full conversations with Faith the way she wants to direct them. Jacob’s story was clever, but sadly I did see it coming because everything was so repetitive and it is even spelt out for you during your rescue. That and John’s story was so epic! Saving a whole town, then the eventual dog fight flying over the region! It was so good and it was hard to live up to after that. It’s odd that I feel that way because to me Ubisoft games like this tend to feel almost routed in reality. Which is funny to say with the more sci-fi elements of Assassin’s Creed. But it seems like a lot of punches are pulled. Bayek in Assassin’s Creed Origins felt like a polar opposite Geralt from The Witcher series. There was always some logical explanation to Bayek’s quests it seemed and anything else was a glitch in the animus. Far Cry 5 almost does the opposite, and honestly I think if that was more in your face I would have been happy with it. If it wasn’t nuclear annihilation but just world cleansing fire of an unexplainable type, I wouldn’t have just immediately blamed Joseph. I didn’t feel he was right. I felt he was a jerk who planned this. I kind of wanted there to be something like that. I wanted something different than Ubisoft leaning toward a logical explanation. I applaud them for having a diverse team and playing to a diverse audience, but it’s a video game. Geralt’s adventures were unpredictable because there were outcomes beyond the logical. Even if for him it was more of a, “It’s this kind of monster, they do that, duh,” sort of response to some adventures. So, why so many paragraphs? Because I really enjoyed Far Cry 5’s world. Yes, I felt like it was rinse repeat with the generic elements of each region, but the story and side missions are good and well written. If anything the ending and small irk above aside I’d go as far to say this is my favorite writing in an Ubisoft game. For me, this is my Mass Effect 3. It’s not the ending I wanted. I adore the countryside and I will go back and play the game more. That says a lot. Usually when I exhaust a game and complete the story, that’s it. I want to play in the enjoyable sandbox of Far Cry 5’s world, even if that may mean resetting the game and getting all the Peggies back. It’s just that much fun! Let alone I’ve only started into the Arcade mode of user created content. Just, give me a chance to fight back or at least wrap up the story. This isn’t a movie. It’s the content of a full TV series with season four being me walking up to Joseph’s church only to be greeted with, “Well that’s the season finale folks! Right here in episode one of season four!” Like even by video game standards in Ocarina of Time you didn’t just march into the castle, walk right up to Gannondorf and decide between two options. I at least expected that Jospeph had a bunker under the compound. Maybe even missile silos there that we didn’t know about. After all, we saw missile silos in the bunkers of the other leaders. Silos that NO ONE QUESTIONED. Did I miss a mission? A conversation? Did no one ever address that there was a huge James Bond villain plot going on here? Which leads me to blame Joseph at the end of the game because he clearly had access to missiles. So Joseph isn’t “right”. It’s not a miracle, a coincidence that fire rains at the end of the game. It’s just him making it true. The logical explanation. The game is wonderful. It really is. Just don’t bother going back to Joseph’s church at the end. Keep the bright and happy title screen you know and love and enjoy the sandbox that is Far Cry 5. It really is worth it so much, despite the ending.